Dr. George Vitale’s fascination with the fighting arts began with Western systems as a youngster with boxing, spurred on by his Father’s interest. As a teen he trained in Wrestling, competing locally in both. His introduction to the Eastern Arts began with an exposure to Tang Su Do. Thereafter he enrolled in Taekwon-Do under the tutelage of Master Kim Kwang-Sung (K-7-45) at ITF Main Gym #21 in the early 1970s. Grandmaster Kim born in Gwangju, Korea was originally from the Moo Duk Kwan and was a Taekwon-Do Pioneer in West Germany. 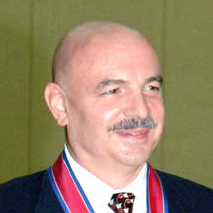 Dr. Vitale’s extensive involvement in Taekwon-Do saw him traveling nationally since 1984 and internationally since 1987. To date he has been to over 70 countries pursuing his love for Taekwon-Do, as a student, teacher, researcher and producer. His main area of interest is the history of Taekwon-Do. He is currently involved in 3 documentaries and writing a book on the subject. The Graduate School work he has done since 1993 has culminated in his earning an academic Doctorate Degree from north Korea, the first American to ever do so. As a result of the expertise he has developed over the decades he is often invited to share his experiences with various institutions and media outlets. Master Vitale is happy to have the opportunity to now share with followers of this website.